The National Transportation Safety Board (NTSB) on Oct. 30 ruled that flaws in Union Pacific’s approach to inspecting, maintaining and repairing defects on the Estherville Subdivision helped to cause a March 2017 derailment that resulted in multiple tank cars spilling undenatured ethanol in Graettinger, Iowa. A rail near a transition onto a bridge broke, causing 20 tank cars to derail in the accident that happened at 12:50 a.m. local time March 10, 2017. Fourteen of the tank cars spilled 322,000 gallons of ethanol, causing a fire that burned for more than 36 hours. Three nearby homes were evacuated as a result of the accident, which caused an estimated $4 million in damage, including the destruction of 400 feet of track and a 152-foot railroad bridge. NTSB investigators survey the March 2017 derailment of a Union Pacific train carrying undenatured ethanol in Graettinger, Iowa. During the NTSB hearing, board member Jennifer Homendy said she made a review of a decade’s worth of accident data for UP and the numbers showed one thing in common. “Every year, track defects are the chief cause of accidents with UP,” she said. Along Estherville’s 79-mile stretch, Homendy said that 102 defects of “marginal” and “poor” crossties were identified over a two-year period from 2015-17. After the carrier received the reports of rail or crosstie defects, chief accident inspector Michael Hiller said UP didn’t take enough steps to fix the problems prior to the accident. “The inspectors were going out and they were doing their inspections, and they were reporting the conditions of the tie,” Hiller said. “In many cases – more than 100, as member Homendy pointed out – there were remediation efforts, and it’s clear based on our observations post-accident that the remediation efforts restored the track back to its minimum condition that it needed to sustain traffic. Also contributing to the accident was what NTSB described as “inadequate oversight” on the part of the Federal Railroad Administration (FRA). While FRA inspectors raised the carrier’s attention to track defects — the agency had just initiated a compliance agreement in late 2016 as a result of a fiery oil train derailment in Mosier, Ore. — and some action was taken, Hiller said not all enforcement measures, such as civil penalties, were used. NTSB investigators also noted that FRA inspectors neglected to report some defective crosstie conditions. After the Graettinger accident, Hiller said that the carrier has shown “very good response” to reports of tie defects and maintenance and has performed twice-weekly inspections on the subdivision in a post-accident agreement with FRA. However, the NTSB did note that there was one week where the carrier inspected the subdivision only once. Finally, the use of U.S. 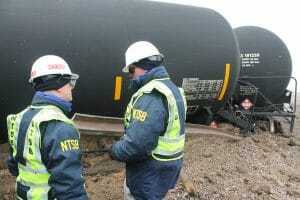 DOT 111 tanker cars to transport the ethanol also worsened the environmental impact of the accident, investigators said. DOT 117 specifications established by the Pipeline and Hazardous Material Safety Agency (PHMSA) add reinforcement and other design features to cars transporting both crude oil and ethanol. “The tougher design would have prevented the release,” Sumwalt said. FRA identifies ethanol as the most hazardous material that is transported by rail in the United States. The denaturing process adds toxic compounds to make it unfit for human consumption and also lessens the tax burden for the carriers transporting it because it is not a beverage. In the Graettinger accident, the ethanol was undenatured, meaning that the toxins were not added to the alcohol being transported. It was suggested that a safety benefit might be achieved by getting rid of denaturants when transporting ethanol. A May 1, 2023, regulatory deadline has been set for all DOT 111 tank cars that carry ethanol to be changed over or retrofitted to meet the higher DOT 117 standards. In order to achieve that deadline, about 350 tank cars per month must be changed over. At the hearing, NTSB issued three new safety recommendations and reiterated one safety recommendation to the FRA, PHMSA and UP. They address training on safety standards and available enforcement options for federal track inspectors, the need for research to determine if safety would be improved by transporting ethanol in an undenatured state, and the need for Union Pacific to re-examine track maintenance and inspection program standards on all routes carrying high hazardous flammable materials. “The recommendations just issued, if acted upon, will result in better training for FRA track inspectors and clear guidance involving available enforcement options,” Sumwalt said. “They will result in UP re-examining its track maintenance and inspection program standards. Today’s recommendations will result in research by PHMSA into whether alcohol — ethanol — should be transported in an undenatured state and furthermore, a recommendation first issued in 2015 and reiterated today will result in progress milestone schedules for the phasing out of the DOT 111 tank cars for ethanol service by 2023, if acted upon. NTSB’s report states alcohol or drug use, and cell phone use were not factors in the accident, nor was the mechanical condition of the train, the performance of the train crew or the emergency response a factor. The full report will be available on the NTSB website when finalized.